There's been a lot of information coming out about Guild Wars 2 after this latest beta weekend, most of it very encouraging. Ravious continues his sterling work over at KTR and Massively put up a series of reports. I particularly liked Jef Reahard's piece but the piece that most caught my attention was the one on character creation. The visual side of the process looks perfectly fine but I goggled a bit at the multiple choice section. I've seen this kind of thing quite often in single-player RPGs, where it kinda-sorta makes sense but to use it in an MMO seems peculiar. Unlike single-player games, MMOs these days generally don't come with a manual the size of a paperback novel to give sufficient context for the questions to be meaningful. 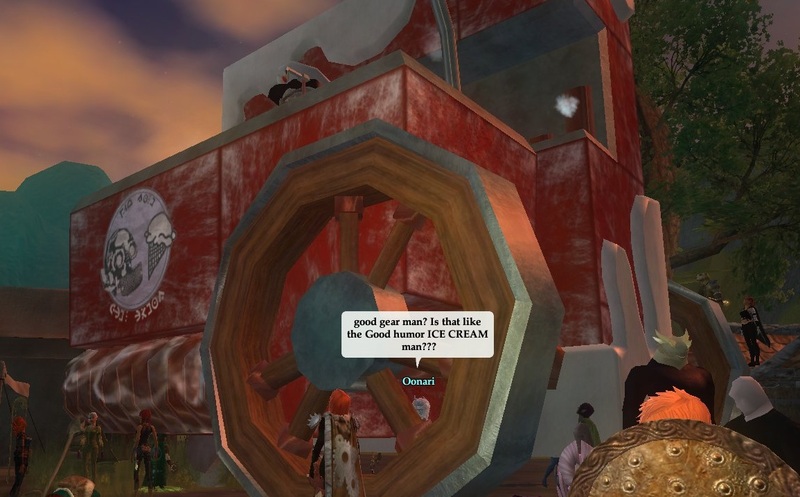 GW2 might get a pass on account of seven years of GW, several novels and a slew of pre-launch lore briefings, but even with that following wind this set of questions doesn't fly. 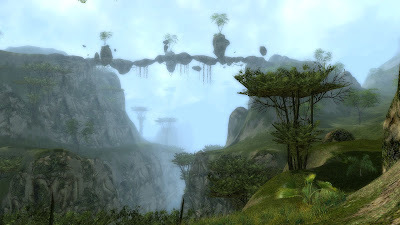 Presumably each has in-game implications but how anyone who hasn't been vicariously living in Tyria for the last few years is supposed to know what they are escapes me. 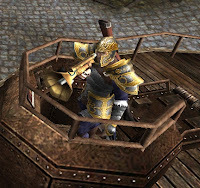 The potential implications of some, like the Streets/Common Folk/Nobility one might reasonably be guessed at, but what are we meant to make of a choice between "A spangenhelm, A cap helm, No helm at all". What is a "spanglehelm" and what does it says about my character that he chooses to wear one? Is wearing one into battle outrageously camp? Indescribably foolhardy? Redolent of deep religious devotion? Maybe I'll know when I've played the game but I'm being asked the question in the pause between installing and starting to play. Same applies to "Trickster demon, Skull, Ghostly wraith" or "Universal multi-tool pack, Eagle-eye goggles, Panscopic monocle". Either these choices have in-game meanings that I have no way of knowing, in which case it's pointless to ask me to choose between them, or they don't, in which case choosing between them is meaningless. The one that really stunned me was Part 8 " "One of my biggest regrets is that _____." (I never searched for my true parents, I never found my sister's body, I passed up an opportunity to perform in the circus) ". What? What?? Is that a placeholder question? Did a dev slip it in to win a bet? I know that if that's still there when I get to choose I'm definitely taking the clown option. A more obvious example of why I don't think this approach works is Part 9 " "Everyone said I was blessed by _____ when I was young." (Dwayna, Grenth, Balthazar, Melandru, Lyssa, Kormir) ". I play Guild Wars so I recognize that as a list of gods but despite having played on and off for many years, that's as much as I can tell you. 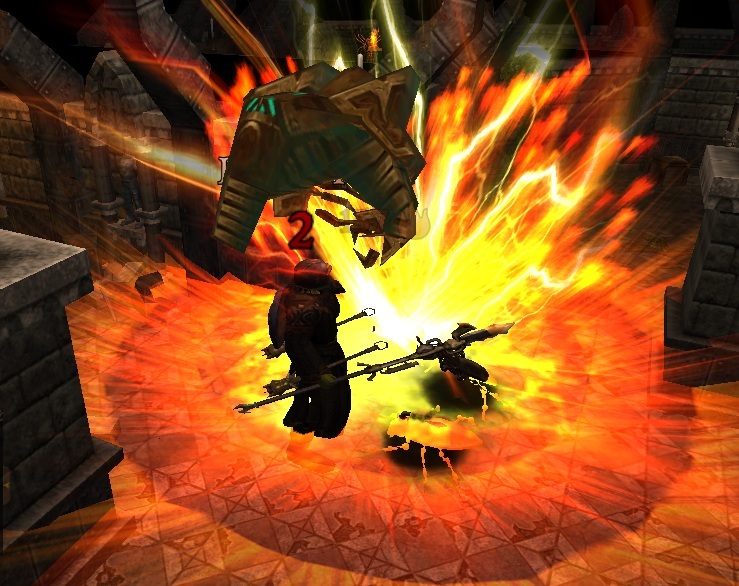 Picking a Deity in a roleplaying game, or even an MMO, often has significant gameplay consequences. I'd like to have a chance to visit a few temples and talk with a few priests before I make a decision of such importance. Indeed I'd much rather learn who my character is by playing him, not through a multiple choice quiz. Couldn't the game observe the actions I take within it and tailor my personal story accordingly, rather than pre-build it at this incredibly early stage? And wouldn't it be better for me at least to have met Maverick, Euryale, Clawspur, Dinky and Reeva before I make up my mind which of them I'd die for? 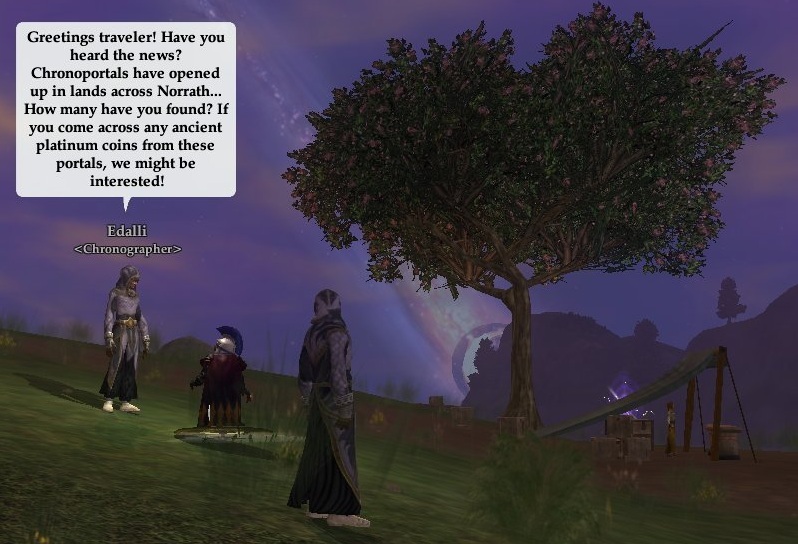 Yesterday I mentioned EQ2's Chronoportal event. It's an atypical example because it seems it was almost thrown together as an afterthought and yet it's all the better for it. The original Everquest understandably makes quite a big deal of its anniversaries and in 2011 EQ2 decided to join in. 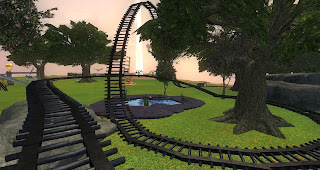 Some of the designers cobbled together eight instances using existing models and zones and drenched them in Everquest nostalgia. They pretty much did it in their spare time so they didn't create any baroque, overwritten story arcs or add any long-winded, time-consuming quest sequences. There's just a quick, optional introductory speech from one of the Chronomages to fit a fig-leaf of lore over the offending intrusion from the world of pure entertainment and then it's straight to the action. Travel isn't an issue. The portals open right beside bells or druid rings so the furthest is at most a couple of loading screens from anywhere. 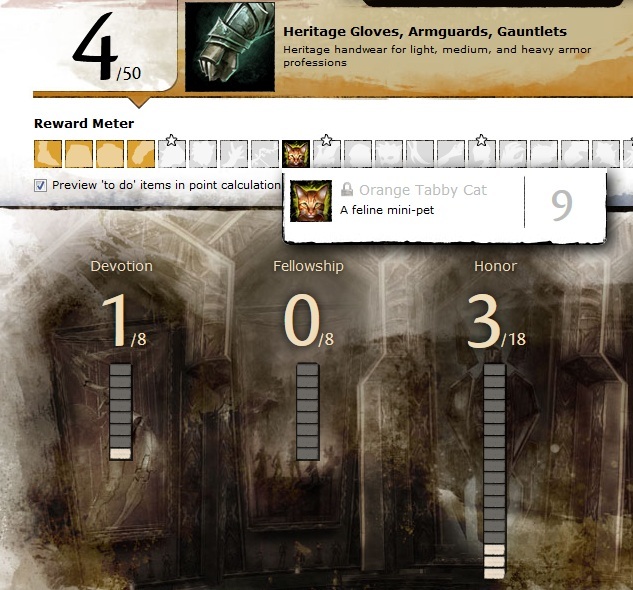 You can't quite group with anyone because each instance (one per tier from 20 to 90) has a minimum entry requirement of ten levels below the tier, but other than that the instance itself mentors you all to the same level when you zone in. Oi!! Biggles!! She's over here! Once inside, all the instances are small and compact. In a good group they each take five to ten minutes. You can run through all eight in an hour or so. 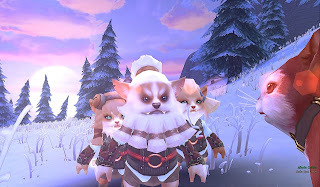 All the mobs are tuned for a group and are quite tough if you are doing them at level, although they can be soloed with care by some classes and by most classes with a mercenary (an option which didn't exist when the instances were designed, of course). What? Yes of course I did a camp check. 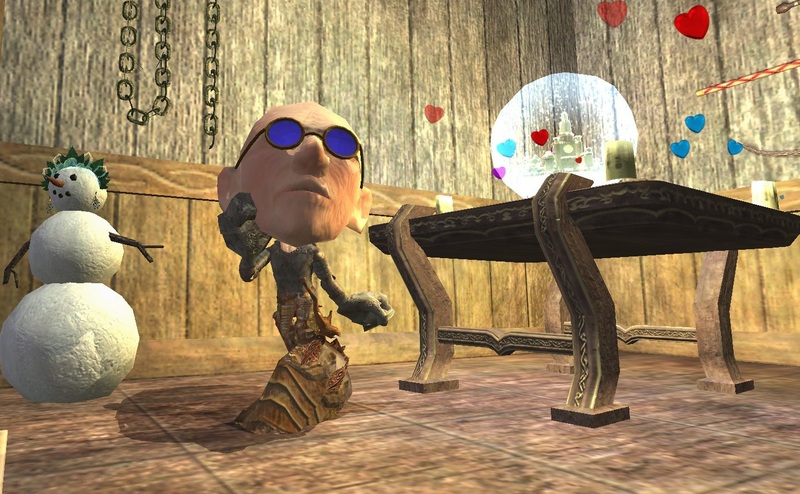 The loot is excellent for level and the event would be popular for that reason alone, but it's also very well-received by long-time players because of the strong nostalgia factor and the really rather good jokes. The boundlessly optimistic Fippy Darkpaw makes an early appearance, to the evident despair of the other gnolls, and several magicians see their epic hopes dashed yet again as they rush back from afk bio to see some guy in plate standing over a pile of horsefeathers. Best of all, a number of adventurer stereotypes offer the wisdom of crowds on how to spawn the Ancient Cyclops. I laughed out loud at these last time and they still raised a chuckle a year later. As well as the good loot that drops, each instance rewards two Ancient Platinum Coins which can be spent at a couple of special vendors. All they sell are nostalgic house items, and each item costs just one Coin. There are twenty-six things to buy (four new ones were added this year), making it easy to acquire all the coins needed to collect everything. The event runs for nine days and doesn't outstay its welcome. It's very much a drop-in event with no compulsion to keep running the instances after you've seen enough (unless you're determined to get the rareish Pegasus Cloak and that might even be a kind of nostalgic meta-joke in itself). It's a textbook example of how to do more with less. First time round it was tossed up with no fanfare or hype and it returned this year in the same way. It's obvious that it was designed by people who were making something they thought was fun and it transmits. When exactly did it start? There must have been a time once, when you could wake up fresh, in that room you favored upstairs along the corridor away from the bar perhaps or maybe out among the pines, rolled in your dew-drenched cloak beside the cooling embers of your campfire, looking forward to a day filled with adventure. Another day of magic and mayhem just waiting to be seized. It is Soulday, Grayeven 3 of the year 3881 and I have otters to train. It's been a busy week. 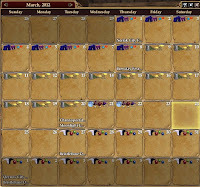 A busy month. A busy year. 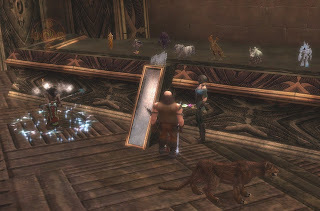 Even before the Frostfell Village wardrobe had folded itself through four dimensions and packed itself flat back under the bed, the ever-traveling fair came rolling into Gorowyn, half-elven barkers hanging bunting from any Sarnak that couldn't scuttle away fast enough. 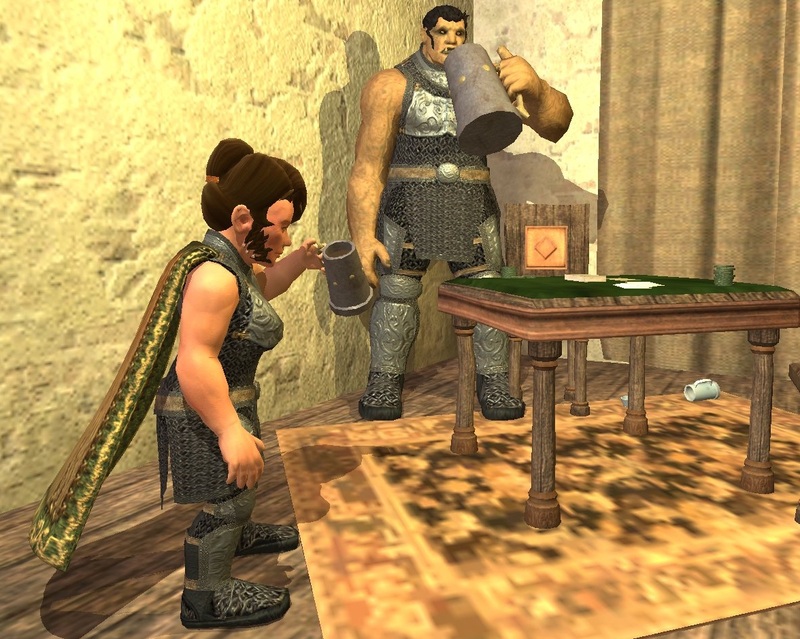 They'd barely packed away their tents before full moon signaled a frenzy of mushrooming and root-beer in fairy grottoes across Norrath. Then there are the Holy Days. The gods made a poor job of being dead, or gone or whatever it is that gods do when they lose patience with being farmed twice a day and five times on Sundays. Errolisi Marr still finds time to sponsor a whole raft of dubious romantic rituals for the day held in her honor. Day? Hah! It lasts two love-sodden weeks by when we're all heartily glad to see the back of her. Don't say anything though because here comes her god-buddy Brell, twenty feet tall with a tankard like a bucket, god of fatty liver disease and drunken one-night stands and another one who thinks there are fourteen nights in a Day. The hangovers have scarcely had time to fade before Bristlebane arrives and we all know what fun he is. Oh come on. Some people have no sense of humor. At least he can count. I think it's some Elven thing? Oh but wait, that's not all. Those are just the events that get on the Calendar. At least that gives them a veneer of internal consistency, unlike meta-events, viz and to wit Everquest's Anniversary, currently being celebrated in EQ1 by the appearance of loot-laden Fabled versions of everyone from Fippy to Venril Sathir and in EQ2 through the medium of modern dance Chronoportals. 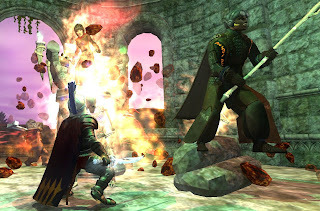 I only pick on Norrath because that's where I spend a lot of my time. I could throw a dart at my monitor and come up with a similar list from any icon on my desktop. (I wouldn't do that. Obviously.) 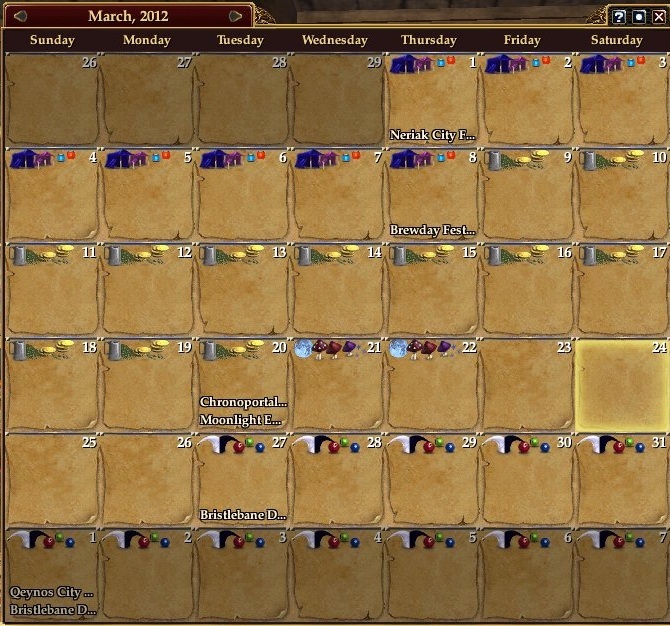 I was barely in Azeroth for three months and I think I saw four major Holidays. Rift is pretty much all either event or holiday, with the current one being a post-modern masterpiece of self-congratulatory backslapping. 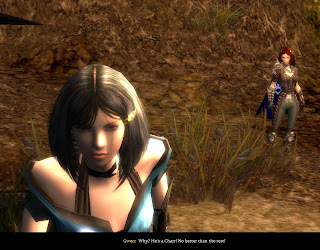 Someone at Trion has the irony meter turned up to 11, that's for sure. Excuse me, weren't we at war? Is it too much? We've done dailies (How we've done dailies...) but dailies at least have the "merit" of always being there. Events bring a pressure if not to complete then at least to take part. They're fun, especially first time through, but they come back year after year and they bloat. All last year's rides return and there are mutterings if anything's missing and if there's nothing new. When does a good thing turn into too much of a good thing? I'm a big take it or leave it-er. In the words of Richard Hell, I can take it or leave it each time. Even so, I get pulled in. I know people who trudge through each Imaginary Holiday with the grim, set smile of an ex at a wedding. I've even known people stop logging in altogether, overwhelmed, unable to keep up. I'm not against fun. 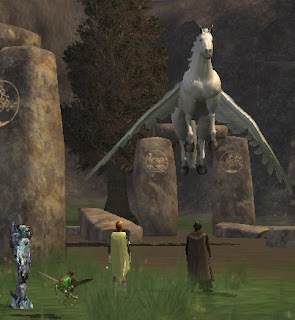 I used to get as excited as anyone when Santug Klaug popped up in Plane of Knowledge and started yelling or when someone started jabbering hysterically over guild chat about giant skeletons taking over Qeynos Hills. But those were surprises. They were adventures. We didn't know they were coming. Not to put too fine a point on it, we didn't have a Calendar! When you find yourself wishing it would just be over already, it's not fun any more. I like events but if we could just snap them along a bit? Maybe the "Days" could last for a weekend, not a fortnight? That'd be a start. Like going to the pictures, do you? The movies, eh, wot? Great stuff! What payment model do you prefer then? Pay each time do you? Hand in pocket, bring out the wedge? Feeling of control that gives you, I bet, doesn't it? Or is it those cards? Buy 'em in foyer is it? The supermarket? Fifty notes, what's that last you? Couple of months? Three?. No, no, of course! You're a real fan, I can tell. You'll be a member, course you will. Monthly is it, your subscription? Annual! You really do like your movies, don't you? Say, whatever did happen to that Everquest movie? Can you imagine sitting in the pub chewing over the pros and cons of how to pay to watch films? Can you imagine having that conversation over and over and over again? Who bloody cares? What film did you see? Who was in it? Was it any good? That's what we want to know. Yes, but how you pay for your movie habit doesn't affect what films get made, does it? Doesn't affect the content. Or does it? You know what? I don't know and I don't very much care. Maybe it does, maybe it doesn't. A million things affect what movies get made and where they get shown but regardless there are always more films being made than I am ever going to see and there always will be. Out of those miles and miles of celluloid (let's not quantify digitally) I am not likely to run out of stuff that appeals to me but I am likely, nay, certain, to run out of time to watch it all. From where I sit there also seems to be no prospect whatsoever of running out of MMOs. There are hundreds of them and they just keep coming. 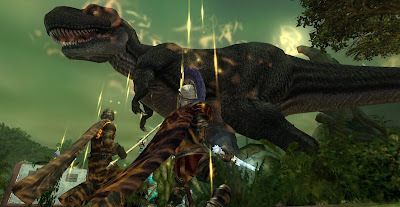 It takes a couple of hours to watch a movie but a middling MMO takes a month or two even for a tourist and a good one might eat up most of a year and that's just on the first go round. One of the advantages usually quoted for the Subscription model is that you have a fixed price point and once you've paid each month you're done paying til next month. Fine. Dandy, even, but that also works in reverse. 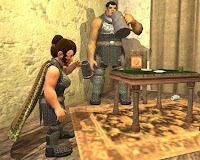 When there are too many MMOs to choose from it's very handy for some to rule themselves out by charging an upfront fee. Really, that's great. You guys keep doing that. Makes for one less MMO that I have to think about. Get back to me when you go F2P. I might take a look then. Oh look, here I am talking about payment models and didn't I just say how dull that was? How did I get onto the topic anyway? 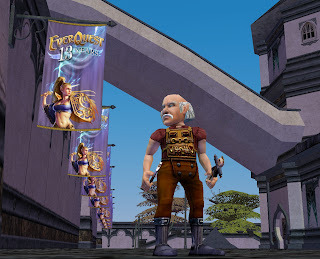 Everquest going F2P, that was it. I was going to write something about it but Wilhelm beat me to it and covered most of what I might have said. 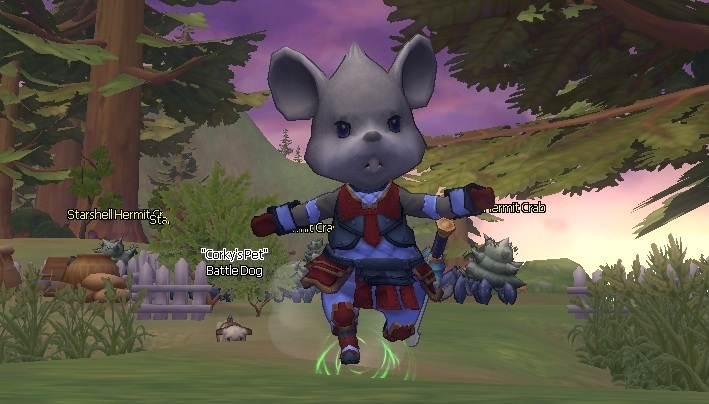 I did make a character on Vox, the new server. I had to, it's a tradition. 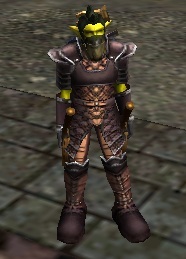 I've made a character on every new EQ server that's launched since 2000. Well, except Stormhammer. Now there's a payment model!. Apparently some people really would pay $40 a month just to have a server to themselves. Not being one of them I never did see Marauder's Mire. 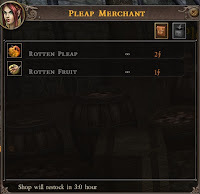 At the moment the main effect of Everquest going F2P has been to rekindle my interest in leveling up my necromancer on Fippy Darkpaw, one of the two Progression servers both of which remain subscription only. It seems the net result of Everquest going F2P for me is that I've started logging in to do something I could have done at any time anyway. Figures. Guild Wars seems to have snagged me again. I think it was the snow that did it. Last time I tried I went pottering through Cantha. Marvelous architecture. Stunning scenery. More bamboo than you can shake a stick at. Not somewhere I wanted to spend much time, though. If it was a real place I wouldn't go there for a holiday. Too humid. Too many insects. The time before the time before that, first time back, I started in Elona. A lot of savannah. Very ochre. Might have worked had I not made the schoolboy error of playing a Dervish. I used to use a scythe now and again when I was a schoolboy, as it happens. Tricky customer, Johnny Scythe but I still have both feet so I must have gotten the hang of it once. Sadly the skills didn't transfer. Inbetween I ran through the Prophecies Campaign just far enough to get me to Lion's Arch. I love pre Searing. It looks remarkably similar to the countryside near here on some golden afternoon at the cusp as Summer turns to Autumn. 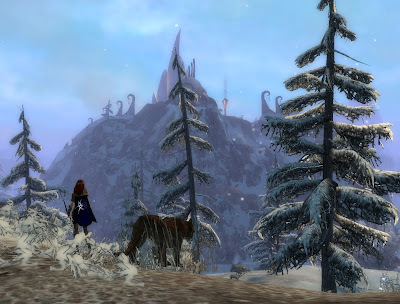 I lingered so long that when in the end I did move on to Ascalon City the war itself was easy going. A skip and a step and I was past the ruins into the Shiverpeaks and all downhill to Lion's Arch. Most MMOs if they've been around a while offer the same collection of climates. There's somewhere like the view from inside the head of an Edwardian author of books for the children of the upper-middle classes. There's some seaside with the village from the Popeye movie (I've been to that set - it's on Malta, an island where after a few days almost any distraction is welcome). There are a lot of forests with suspiciously little undergrowth and a preponderance of sunbeams. There will always be swamps, cold and dank, hot and fetid or frequently both, sometimes at the same time. 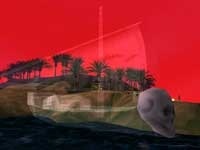 You can count on a pantomime desert or two, all colored tents, camel salesman, flying carpets, genies and thieves. Somewhere there will be a land made entirely from flat rock, lava and steam. Variety, spice etc. Just give me the snow. Falgarholm, Frostshard Lake and Northern Highlands on Telon. Iron Pine Peaks in Telara. 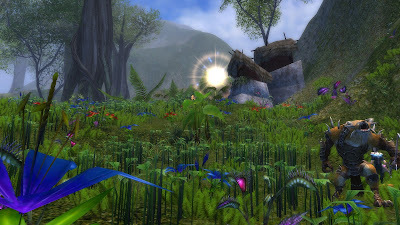 The whole continent of Velious on Norrath. Forochel in Middle Earth. Siveria on that Allod where the gerbil triplets live. Even Dun Morogh on Azeroth. Yes, even there. I just feel settled when the snow crunches underfoot, the light goes blue-white and breath steams. Where you are matters but so does who. When the snow is falling and the wolves are howling out there in the pines, do you really want to be wandering around in a crimson robe, waggling your bare fingers in the bitter air, the hem of your frock sodden with snowmelt up to the knee and the wicked wind blowing your scooped sleeves back up to your elbows? How about a warrior, stumping along in full plate, such a good insulator? I think not. Do you still feel drop-dead cool dressed all in black with your scalpel-sharp stilettos stuffed down each soft-leather boot when the entire world around you is so white it hurts to look at and there's no feeling left in your feet? No! You want a massive axe, a fur coat with the head still on and layer after layer of cloth criss-crossed with a hundred feet of string. That's if you're a dwarf. Or you could go barbarian, lose the cloth and just keep the string so you can really feel winter on your skin. Better yet, wear warm, comfortable, windproof leathers and a take a really big bow. And a wolf. Or a lynx. Even a raven or a hawk. Never leave the Last Inn without some kind of companion animal. Be a ranger. Or a hunter. 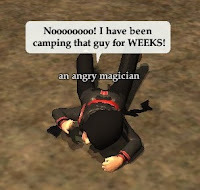 Or a scout. Doesn't matter what you call it, just tame an animal, fletch some arrows and off you go. So that's what I did. 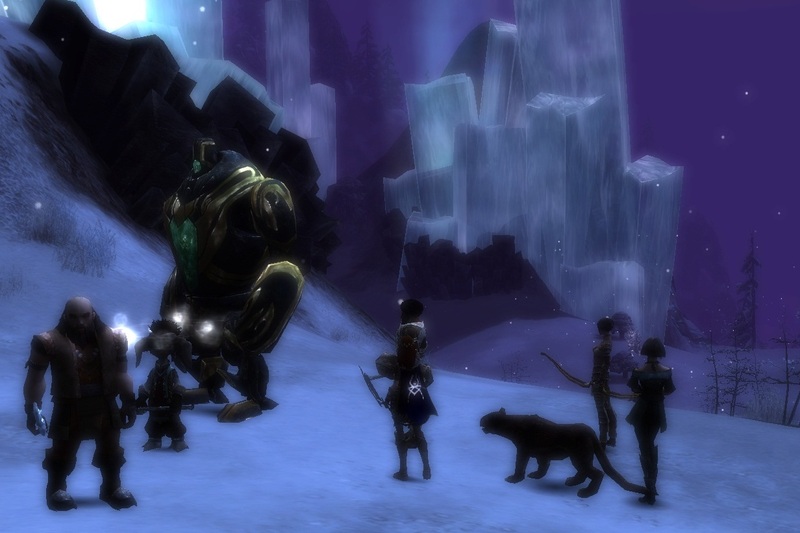 Went with Ogden Stonehealer to raise an army of Norns to help the dwarves beat back the Destroyers and ended up sorting out the mysterious Nornbear and rescuing not just a bunch of captured Charr but the entire Ebon Vanguard legion. And got a tapestry. Very important, that part. Enormous fun. Very good storyline. Engaging cut-scenes. Lots of lore. Paced well enough that I managed to do every mission first time, albeit mostly with everyone on the full minus sixty morale debuff by the time the job was done. A lot of trekking through the snow and goggling at the breathtaking scenery later and here we are, level 20 with three tapestries and five points. Just got to sort out the Asura's little problem and coax my pet up to 20 too and that'll make six. 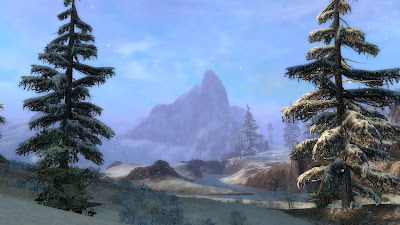 And largely thanks to the snow and the bow I'm playing Guild Wars qua Guild Wars, not just for the points and I think I might know what class I'm going to be when Guild Wars 2 arrives. Hall of Monuments? Pfeh! Not interested. Don't care about that stuff. Can't be bothered. When I play Guild Wars 2 I'll just start from scratch. New account, nice and clean. That's what I said or something like it on several blog threads over the past few months when people were banging on about their plans to collect this or achieve that or maximize the other. Meant it, too, at the time. 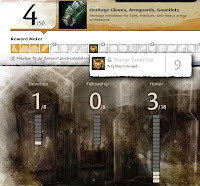 Then ArenaNet had to go and make their Hall of Monuments Calculator. Yes, well, it's different when you can see it all laid out like that, isn't it? Suddenly it all gets a bit "Look at what you could have won" . And it's such a nifty little toy. You play with it for a while and cogs start whirring in your head and you google around a bit and see how you could hoover up a few points for doing next to nothing. Honestly, it would almost be rude not to, wouldn't it? Look! I have three points already and I didn't do anything! How did that happen? Oh, that's because it can see I already have a Guild Wars account since I just typed in the name of one of my characters and it's assuming I'm going to use the same account in GW2. Well I hadn't planned on it but alright, if it makes you happy I suppose I could. Don't do that! It's tinder dry! Only, which account? I have two. It's that Clean Start thing again, you see. When I got the Complete Collection summer before last and thought I'd play through all the campaigns I didn't want to use the old characters so I started over. 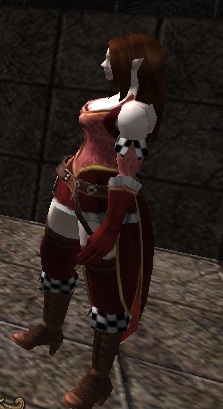 Then I got distracted by something, EQ2X probably, and last I saw of her my new ranger was Level 14 in Lion's Arch. Quick check. Yep, that's where she still is. What's she got in her bags? A present? And inside it a little hydra. That must be one of those minis I read about. Whirr go the cogs. If she has a one-year present, what do the six-year old characters on my old account have? Bags full of presents? Yes they do! All four of them were made in the first month after launch so that means six birthday presents each! Does he ever stop buffing himself? Slight problem - that account doesn't have Eye of the North. Got to have that or you don't get a Hall of Monuments, can't place the minipets, don't get any credit for them in GW2. Putting the complete collection on a new account is looking like a really bad decision right now. Except, wait! People keep going on about buying these pets. That means they must be tradeable! Two dozen unwrapped presents, some map-clicks and a flurry of furtive exchanges in Ascalon City later, problem solved. 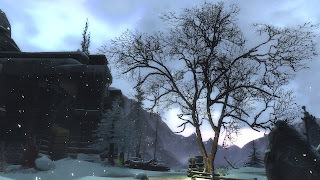 Why Ascalon City? It's the furthest two of the four Elders ever travelled. And ever will, most likely. Warp back to Eye of the North and in we go. Talk to Gwen (what's she doing in there anyway?) hang a tapestry, place the pets. I just need five points for a title. Traveler. That's a good title. I'd use that. And I have M.O.X. He's a free point if I can place him on his pedestal. Only to place him I have to hang another tapestry and that pool in the middle of the Hall isn't spitting out any more free ones. Which is how I came to spend most of yesterday afternoon working through the primary quest sequence in the Eye of the North campaign. Made almost two levels. Wiped on Scorch Maulclaw about ten times. Gave up. Going back today with different tactics, if I can think of any. I'll get him in the end. Then it's on to Doomlore Shrine, rescue Pyre's warband and get my tapestry. Because he'll get me a Tapestry, Gwen! Try to keep up! 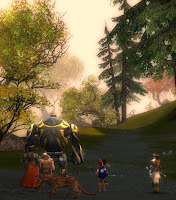 We've got, what, three months before GW2 is likely to land? 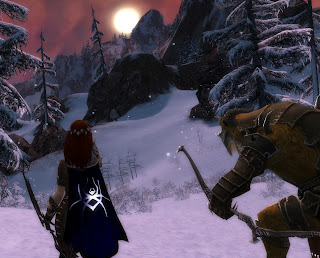 I want to finish the main questline in Eye of the North by then, learn to see the Charr as something more than the faceless monster hordes I remember from Prophecies. Meet the Asura. Those are the two races I plan on playing in GW2 so I probably should. Not to mention I have my eye on that Orange Tabby Cat siting there waiting at nine points. Potpourri. Ah the evocative scent of air-freshener sprayed over garishly stained woodchips! Unforgettable, unfortunately. Let's bin that and have a few random thoughts instead. This EQ2 news just in on the long-promised Update 63 contains several surprises, like a two-point hike in the level cap, bringing it to an idiosyncratic 92 for example.. There has been some muttering that the EQ2 engine or database or prime directive or something makes it very difficult to add any more levels and that 100 may be the theoretical maximum. Eking them out at one or two every other GU should see us through to EQNext. I'm very glad to see them, anyway. I love new levels and these come as a complete surprise. So does a new overland zone although only because I haven't been paying attention, I suspect. I hadn't heard any hints about Skyshrine instances having solo modes either. That's a welcome innovation. New Beastlord warders, dungeon maker themes and tradeskill apprentices will all get used in this house. In fact, it looks like an excellent package. I can hear the complaining already. The only drawback is that it lands on April 17th. There must be a significant chance of Guild Wars 2 beta weekends around then. Which I wouldn't have expected to be an issue, what with the million sign-ups and all, if it hadn't been for today's big announcement. 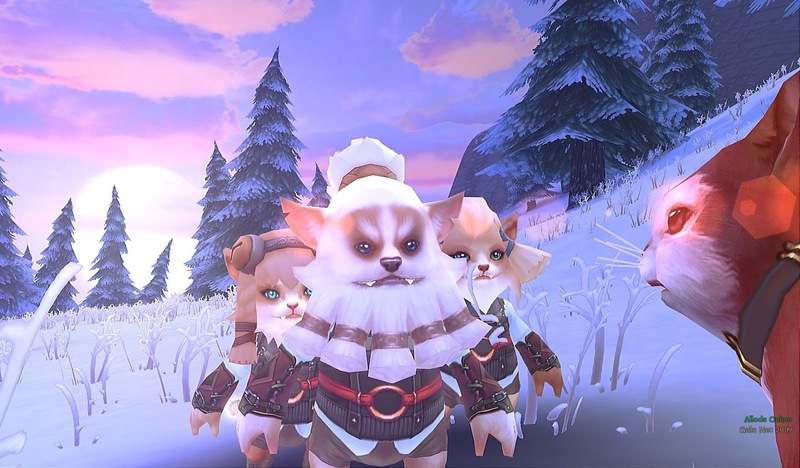 Guaranteed beta weekend access and three-day headstart means pre-ordering is mandatory chez Bhagpuss. Only the Standard Edition. I have enough places for dust to settle already so I don't need a pottery Charr and the extras in the Digital Deluxe Edition look, frankly, pants. Lucky I have most of the second half of April off work. Now if they'd just settle a launch date I might be able to book my June holiday. Everquest the Elder goes Free To Play this Friday. That'll be fun. They're allowing a full 24 hours of downtime and I bet it still won't be enough. It doesn't include the Progression servers, on which Legacy of Ykesha and LDON have just gone live. I hopped on and made a Froglok (see what I did there?) just to prove I could. No plans on playing him. I will be leveling my Necromancer this week, though and come Saturday or Sunday or whenever I can actually get in I'll be making some new characters on my Silver accounts and basking in that glorious New Start Chaos. If anyone turns out to give a damn that a 13 year old game just opened the doors for freeloaders, that is. Played a little Loong today. It really is gorgeous. I swam across a lake from the level 10 starter area to see what was on the other side and found myself in a level 65 area. A bit random but pleasantly trusting of the player's ability to adapt, I thought. I'm struggling to find what to do next there. If there's another quest hub I can't seem to find it. that's how I came to be swimming a lake in the first place. I'll just go exploring. Something will turn up. That leaves the little matter of visits to Dragon Nest, Aerrevan and Wurm, some City of Steam before it goes away for a month and plenty of EQ2 and Rift on my to do list for the rest of this week. Oh, and Clone Wars. I saw the press release about the ten million players and thought it was really about time I at least logged in and had a look round. Ok, I'll be honest. I read the bit about punting JarJar and wanted a go on him. There was a lot more going on than I'd imagined. I thought it was all mini-games but there seem to be explorable MMO-like areas, there's decoratable housing, quests and all sorts. I will be investigating further. Never seen so many SC Store signs in one place before though. I'm blase about cash shops as a rule but the blatancy took even me aback. That's all for now. Time to go train those otters. The City of Steam Sneak Peak has been extended to Thursday, which gives me a chance to try out the remaining two classes. There are four altogether: Warden, Gunner, Arcanist and Channeler. I'm a little hazy on how the roles fall out between them. The Warden is a tank, for sure. The Gunner is ranged DPS, I think, but so is the Arcanist. The Channeler is Healer/Support and also the one I've not tried yet. Everyone but the Warder uses magic, even the Gunner. I thought they were just firing pistols and throwing bombs but it seems they're using their own blood to "transform their sidearms into occult implements". Is that legal? It makes more sense than the the Channeler job description, anyway, which claims they're bardic healers who use "battle-hardened musical instruments to turn the steel eye of the World Machine to the suffering of their companions". Run that by me again? No-one is officially Melee DPS, although I think everyone can dual wield. Unless the Channeler can't. Hang on, let me make one... Yep. Dual-wields blunt weapons, starting out with Censers, incense optional. I was hoping he might clout ratlings upside the head with a brace of maracas. Maybe later. And yes, there are ratlings. They don't wear any clothes or talk, at least not the ones I've met (and by met I mean chopped up with a big sword). But, hey, they walk on two legs so they count. The Warden and Gunner I covered last time. The Arcanist seems to be the classic glass cannon. She gets Fire, Ice and Electricity lines, heavy on the AE. The explosions are spectacular. Most solo fights end with her standing in the middle of a pile of dismantled clockworks, beating the flames out of her dress. I took mine down to level 14 of the Nexan Archives. and she didn't die once. She nearly died about twenty times. Not for the faint of heart. And that's just the healer! The Channeler gets Fire, Sound and Light lines with some very nice visual effects. All healing and damage derives from a multiple of weapon damage, which I think is true of all the classes. Everyone gets the same vast number of stats. Seven active, seven passive, ten resists making a grand total of twenty-four. That won't last. Items have negative as well as positive stats. Neither will that. Armor has three resistances, different to the ten general resistances. There are at least four grades of armor. Weapons and Armor have class restrictions. I said it was old school! City of Steam is a real rpg statfest but the UI is so elegantly designed that I haven't found it in the least overwhelming or confusing. It's certainly counter-trend, though, which can't be said about the choice of races. Steampunk does not say elves to me. Nor orcs. It might possibly say dwarves, at a push. CoS offers a choice of nine races and five of them are varieties of elf or greenskin. 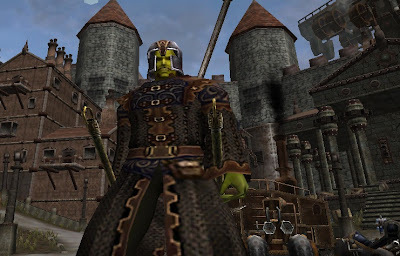 The three greenskins (they call themselves that and it's true) are Goblin, Orc and Hobbe. I'm guessing the Hobbe is a Hobgoblin although they're big enough to be ogres. I called mine Calvin. I assume everyone will. The elves are the first elves I have seen in many years that I would willingly play. They look, sound and act more like pale, fin-de-siecle goths than elves. If they didn't occasionally mention their elvishness I'd have guessed they were vampires. They come in two flavors, Riven or Draug, the main difference between them being their lifespan, short for the Riven and long for the Draug. How that will impact gameplay I cannot say. Ask me in fifty years. Oh, and one kind is blue. The rest of the races are humans of different regional background and attitude. I notice they are all White European in appearance. There's no option for skin color (so far) at character creation either. I think the elves work. I remain to be convinced about the Greenskins. I'd have preferred Steam Dwarves as a playable race. Or ratlings, although that might just be me. Still, it's early days. Much could change and much remains to be revealed. The website suggests a considerable level of political intrigue to come, of which as yet there are barely hints in the game. There's no mention of crafting but I'm sure it's on the way. There are vendors for Oil and Coal. Also Pleap, Toap and Hawte which appear to be foods. Or diseases of the sheep. One or the other. On the subject of vendors, they all have a timer that tells you when the shop will restock, which suggests an interesting scarcity mechanic could be in the plan. A variety of "Repair Materials" drop in dungeons for which there is as yet no use. They look like crafting raws to me and I hope that's what they are but could they point to armor and weapon degradation. I hope they don't. I could go on, and on. And on. But I won't. 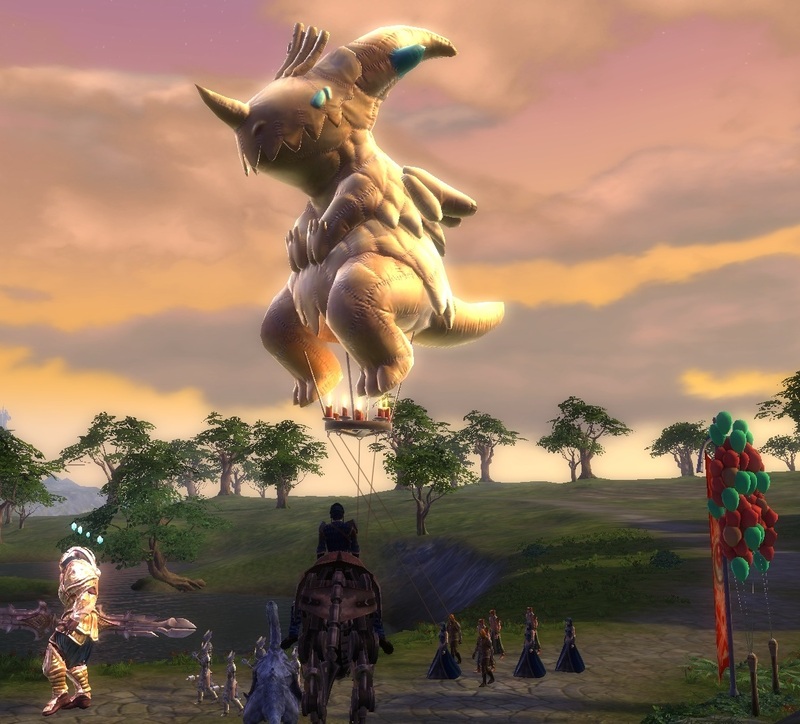 This is now my most-anticipated MMO save only for Guild Wars 2. I'm going to miss it when the server closes on Thursday. Here's hoping for an alpha invite in a month or so. More chance of that than a GW2 beta invite, that's for sure! 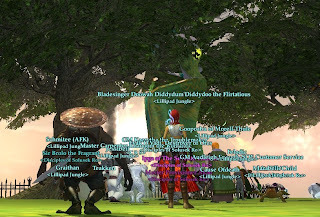 If you play EQ2 you probably heard about it. Zam and EQ2Wire reported on it. TwitchTV livestreamed it. I've seen a few cross-server events over the years but this was one of the biggest. I first heard about it when I came home from work one day last week to find Mrs Bhagpuss doing something or other on Guk, a server we've never set foot on. A quick read of the thread on the SOE forums explained what and more importantly why. We didn't see much of her on Freeport over the next few days. She was grinding writs to help level the new guild or building the playground up on Ribbitribbit's sky island along with half the decorators from Freeport, Antonia Bayle and who knows how many other servers. People from all over the world came to Guk to do what they could for the cause. Some started from scratch on a server they'd never visited before, some paid for transfers to bring their high-level crafters over. Are you sure that thing's safe? In a few days they not only built a magnificent playground in the sky, they leveled a guild to 70th so they could add a T3 guild hall. When the presentation party kicked off on the Mara docks at 4pm EST, a handy 9pm in our time zone, many of the crafters stayed at their workbenches and forges, pushing the guild on to 77th so they could add a pirate ship. 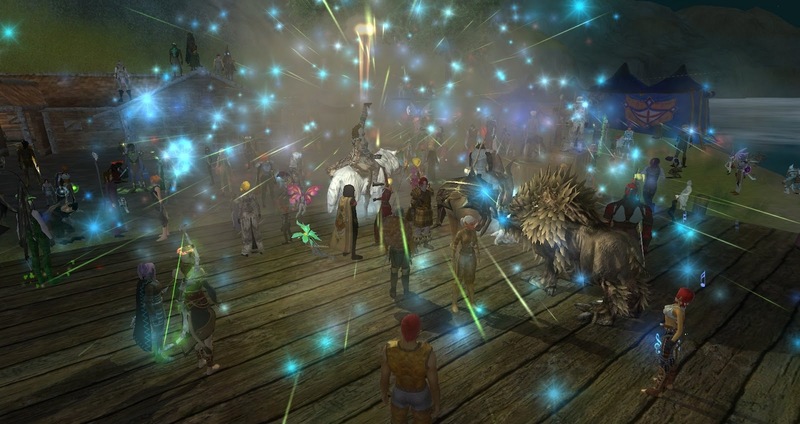 I was at the party on the docks taking dozens of screenshots and firing off fireworks. Who knew Tunare could frug? After I left the party moved on to the playground in the sky and I came back for another look. Never seen so many GMs and guides in one place. 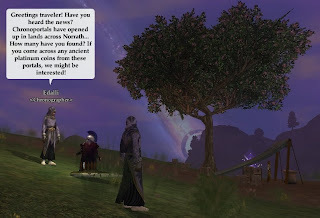 At various times I spotted Feldon from EQ2Wire, Niami Denmother from EQ2Traders (she'd been grafting away at the craft tables all week) and Domino, late of this parish. 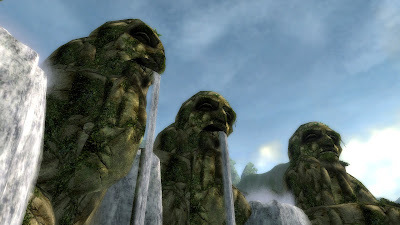 Even the goddess Tunare put in an appearance. It was an amazing event. 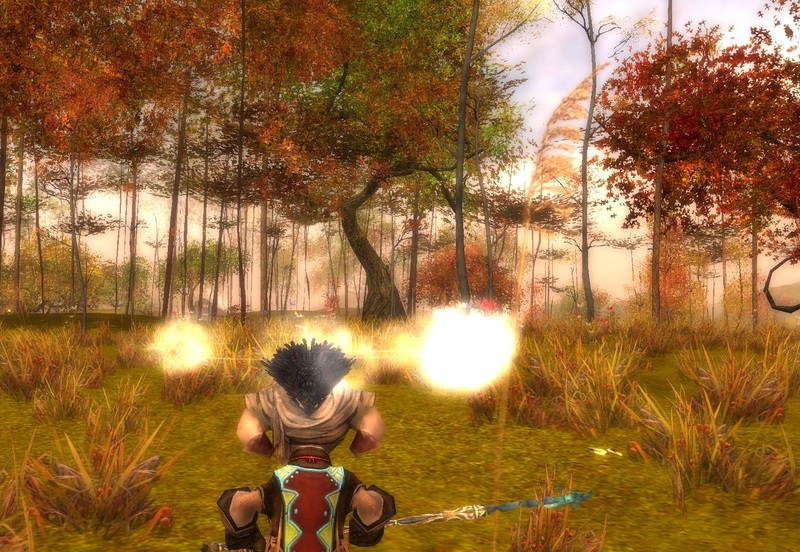 What we all thought MMOs were meant to be about, once. So terribly sad that such a positive, creative community drive was sparked by the terminal illness of a child but at least it may leave some lasting memories and even friendships. Many congratulations to all who helped and best wishes to little Ribbitribbit and his family.